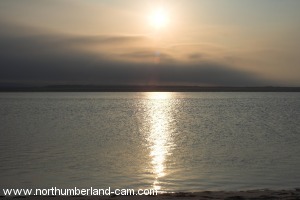 Bamburgh and Budle Bay Evening Walk. 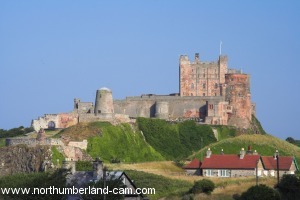 This walk starts at Bamburgh and follows a circular route along roads to Budle Bay and returning along the coast to Bamburgh. 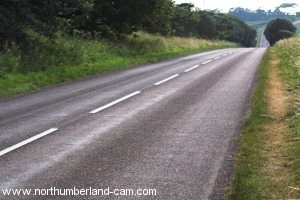 The route could be followed in either direction, we chose a clockwise one. 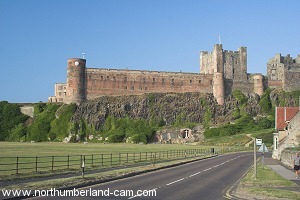 There is a large (pay) car park near Bamburgh Castle or (free) parking between the village and golf course, which is where we started from. 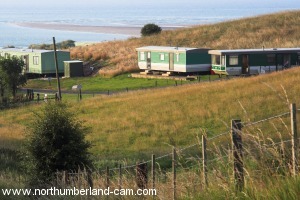 Toilets are in the centre of the village. Approximate distance is just under 4 miles. 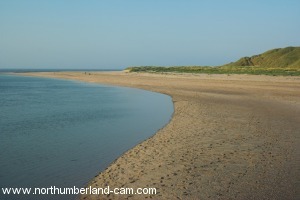 The walk is probably best done at low tide as the sand at Budle Bay Beach will be firmer for walking. 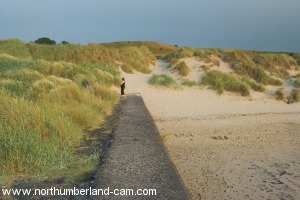 There is also a shoreline path that avoids the beach if you wish. We did this walk on one of the hottest days of the year in the evening - it became hazy and quite cool very quickly, so the need to carry something warm was emphasized. 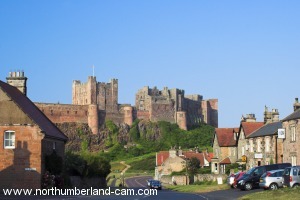 If you park on the coast north of Bamburgh start by walking back along the road to the village. 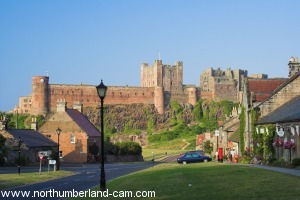 The castle dominates the village wherever you are and there are great views of it as you approach the village. 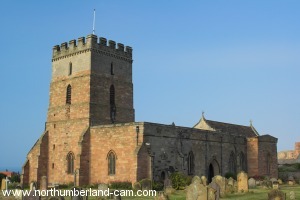 When you reach the village stop for more great views, on your left to the castle and it's clock tower. 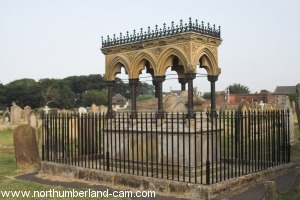 There is a monument at the base of the castle worth a short detour if that interests you. 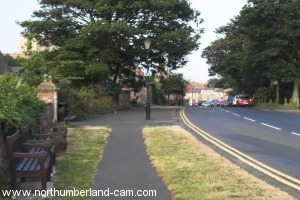 Otherwise, turn right and walk through the village, taking the right hand road where it forks. On the right after a short distance are toilets. 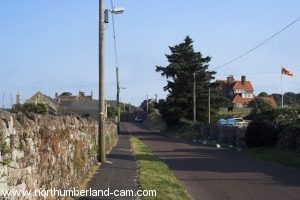 Follow this road out of the village, stopping at St. Aidans church on your right. 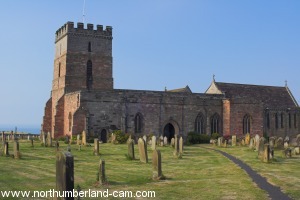 In the churchyard is a memorial to Grace Darling, the famous local heroine who rescued shipwrecked sailors at the Farne Islands in a rowing boat. Seats outside St Aidans Church. Keep on the right side of the road and continue out of the village. The road is straight and fast so watch out for fast cars. 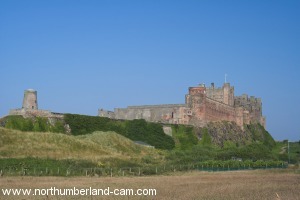 Looking back at Bamburgh Castle and Church. 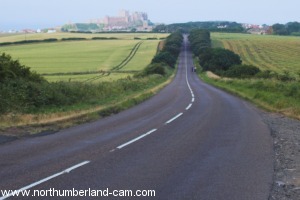 The road out of Bamburgh. 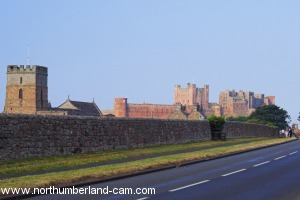 After a while the road turns to the right, look back at this point for another great view of Bamburgh Castle. After the bend the road straightens again and heads downhill, then turns to the left. 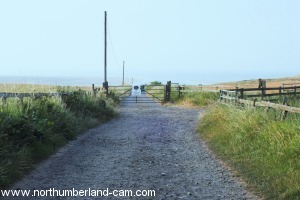 At this bend you must turn right onto a narrow track towards "Heather Cotts" look ahead at the junction and you will see a gate so you know this is the right track. 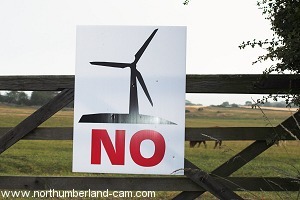 Sign on a field gate. 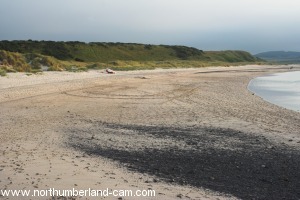 The track to Heather Cotts. 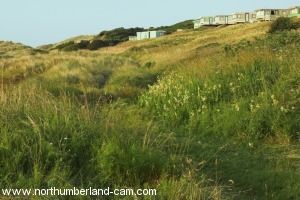 Proceed through the gate and follow the track down to the dunes, passing a caravan park on your right. 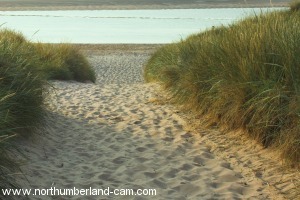 A track straight through the dunes takes you onto the beach at Budle Bay. 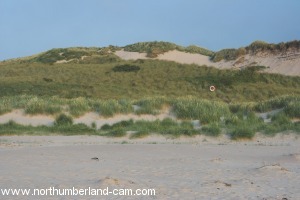 Alternatively you can wander to the right through the dunes and find your way onto the beach further along, over the top of the dunes. After a short distance you will reach an old jetty, from where there are good views to the Cheviot Hills on a clear day or evening. 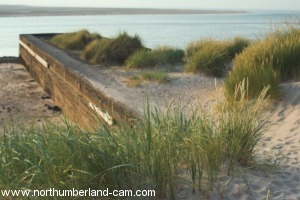 Beach and Jetty at Budle Bay. 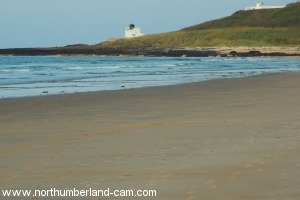 Past the jetty continue along the beach which curves to the right at Budle Point and follow this beach towards Bamburgh Lighthouse. 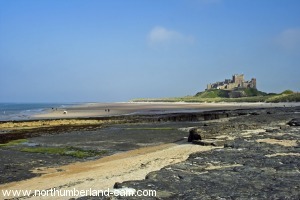 Beach and rocks towards Bamburgh. 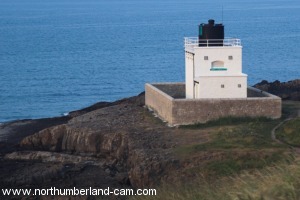 It is possible depending on the state of the tide to continue along the shore to the lighthouse if you like crossing rocks on the way. 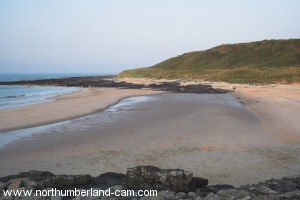 Otherwise, climb up from the beach after a while to follow a rough path up onto the golf course where a footpath takes you past the club house, opposite the lighthouse and back onto the road to Bamburgh. 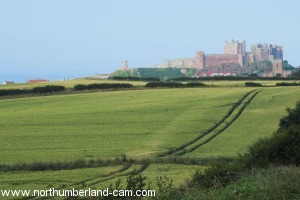 Ahead once again is Bamburgh Castle, with great views along the beach as well. From here follow the road back to where you started. - Good walking boots or shoes adviseable.